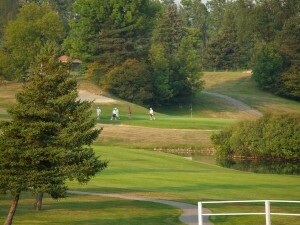 Pine Valley Golf & Country Club is a spectacular wooded 27-hole course located in beautiful North Macomb County, Michigan. We offer a wide range of amenities and services that are usually synonymous with private clubs, but in a public setting. Within the Pine Valley Golf & Country Club’s property, visitors will find a very challenging 27 hole golf course, a beautiful clubhouse with stunning panoramic views, practice facilities, scenic wetlands situated throughout the course. We also have a Pro Shop that carries the necessary golf equipment, accessories and apparel for both men and women. Pine Valley’s sportily appointed clubhouse features a dining room which serves lunch and dinner Monday through Friday and showcases a fully-stocked bar. After a round of golf, players are invited to unwind on the outside terrace, reliving their game while enjoying the breathtaking views overlooking our signature #9 island green at sunset with a cocktail at their fingertips. Catering facilities are also available for many types of golf outings and or any other private affair desired. Start your event around sunset and you will have the most memorable views of the golf course at dusk-that’s a promise! The majestic, panoramic view from Pine Valley’s restaurant overlooking the entire golf course is second to none in North Macomb County. Serving lunch and dinner daily, except weekends, the public can enjoy first class food with country club service.